Birthdays the Beginning is a simulator of God, or rather, a sandbox game in which we can create all sorts of cube-shaped worlds and inhabit them with an enormous amount and types of beings. As part of our divine powers, we will be able to shape geography and alter the temperature of each world to create the right living conditions for each species and witness the birth of an entire ecosystem. In Birthdays the Beginning the only limit is imagination. Create all sorts of worlds, from high and rocky mountains with their own ecosystems and extreme climatic conditions, to all kinds of jungles and extensive forests plagued with life, from single-celled organisms to complex multicellular life, including plants, mammals, dinosaurs and much more! 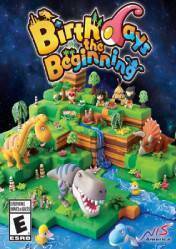 There are no comments yet about Birthdays the Beginning. You can be the first one! Let's Play Birthdays The Beginning - PC Gameplay Part 1 - Let's Get Prehistoric!